On narrow sidewalks, there's often a tension between different users and activities. But sidewalks in an urban place need to make room for people to do more than just walk through. 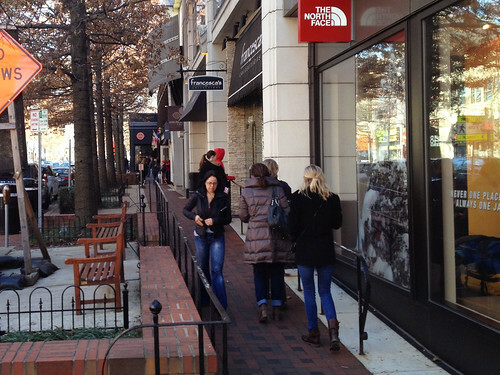 Pedestrians shuffle through the sidewalk on Bethesda Avenue. All photos by the author. On Black Friday, I went to the Apple Store in Bethesda Row to get my computer checked out. Though the area is a really popular destination for shopping and dining, the sidewalks are surprisingly narrow, and seemingly designed to make walking difficult and unpleasant. Here's the sidewalk two doors down from the Apple Store on Bethesda Avenue. Next to the curb, there's a row of big, mature street trees in large, fenced-off planters. Where the buildings step back, there's also a little seating area with some benches. The level of the street falls about a foot here, meaning the seating area is actually below the sidewalk. So there's a brick wall around the benches, just in case anyone falls. That leaves about four feet for the actual sidewalk, which becomes a narrow channel between the storefronts and the brick wall. Since it's also on an incline, there's a railing to meet the requirements of the Americans with Disabilities Act, blocking off about a foot of sidewalk between the railing and the storefronts. The woman in the red coat is about to walk into a railing. On a busy day, or frankly on any day when people are outside, you can watch folks struggle to pass each other through this slalom course: shoppers with bags, parents with strollers, or groups of friends chatting. They look down to avoid eye contact, form a single-file line, or swivel their bodies to squeeze through. 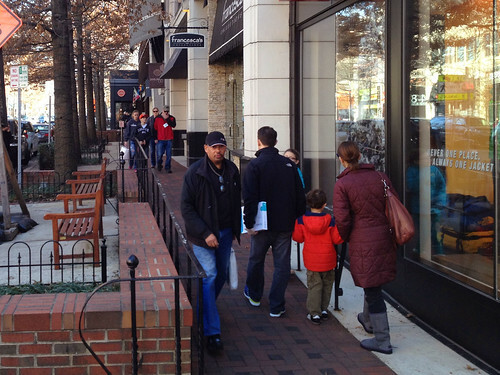 The sidewalk discourages strolling or lingering here, which is part of the attraction of Bethesda Row. 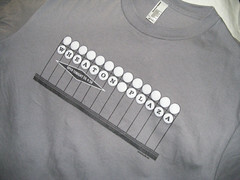 Given, this is right across from Bethesda Lane, a pedestrian-only street. And Bethesda Avenue itself is a pretty narrow and slow-moving street, which is much nicer to walk along than Georgia Avenue in downtown Silver Spring, where the sidewalks are similarly pedestrian-hostile but there's far more car traffic. But it still shows what happens when designers and engineers don't really think about the experience of walking through a place. Bethesda Row has most of the pieces to be a great place to hang out and gather, and most of the time it works really well. But poorly-designed sidewalks make it hard to enjoy being here.